Hip hip hurray for roses! As summer draws to a close and autumn approaches, one of the pleasures here is foraging for edibles. From mid-July until October time, Norwegians love to pick their own wild berries and fungi. Cranberries, wild strawberries, raspberries and blueberries are amongst just some of the berries you may find. Here are some I discovered walking around today. The relatively wet summer this year means that there may be lots more fungi. Up to now during mushroom season, it has been possible to find ‘soppkontroller’ at weekends in many areas of the Oslo Marka (forest). This had been organised by Norges sopp- og nyttevekstforbund. They would be on hand to advise on which mushrooms were edible and even check what people had picked for added reassurance. Unfortunately this year, they can no longer provide this service but you may be lucky to spot them at a local market to ask questions or pick up a leaflet. Alternatively they are running courses, and every Sunday from 16 August – 4 October they’re organising mushroom trips in the Marka. Check out their website for more information if you are interested. This year, I’m foraging for rosehips! Rosehips are the fruit produced after the roses have flowered. They are decorative and attractive to bird life but once rose plants have finished flowering they are all too often neglected. 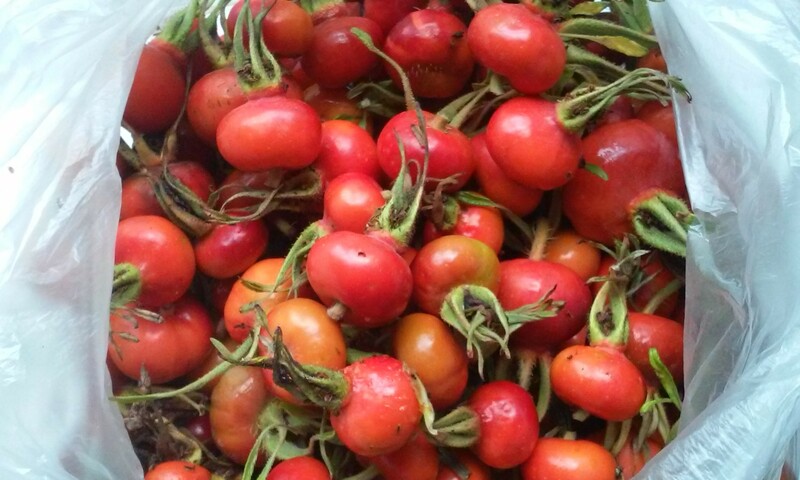 In fact rosehips have exceptionally high levels of Vitamin C and can be used to make jelly, herbal tea or jams, perfect as a vitamin boost over the winter months. I haven’t found any reference to eating rosehips in Norway but in Sweden there seems to be a traditional rosehip soup ‘nyponsoppa’. You can find roses popping up in the most unlikeliest of places, along roadsides, verges or green spaces where they have naturalised and rosehips can be picked right up to the first frosts. Here’s my haul today. I found they come off if you give them a pull by the hip itself or you can snip off them off at the rosehip stalk. Pick the deepest coloured ones and leave the others to ripen a bit longer, but look out for any critters in any softer ones. I’m going to try making this recipe I found online for rosehip syrup. You can make it straight or look for recipes with a combination of rosehips and other fruit such as apples. The syrup can then be used to make cordials or added as a topping for pancakes, ice cream or yoghurt. I’ve collected just shy of a kilo so I’ll just adjust my recipe accordingly. Put two litres of water in a large pan and when boiling add the chopped rosehips and bring it back to the boil. Remove from the heat, cover and leave to infuse for 30 minutes, occasionally stirring. Set the strained juice aside and transfer the rosehip pulp back to the saucepan, along with another litre of boiling water. Bring to the boil again then remove from the heat, infuse for another half an hour and strain as before. Discard the pulp and combine the two lots of strained juice in a clean pan. Bring to the boil, and boil until the volume has decreased by half. Remove from the heat. Add the sugar and stir until dissolved. Return to the stove, bring to the boil and boil hard for five minutes. Pour into warmed, sterilised jars/bottles and seal. Storage tip: Store in small jars as the syrup doesn’t last for more than a week once opened. Alternatively, set aside to cool and freeze as cubes. Categories: Gardening in Oslo | Tags: foraging, fruit picking, fungi, recipes, rosehips, sopp | Permalink.